This house is situated on a domaine in Talmont-St. Hilaire. Perfect for a relaxing holiday of a family with young children! While you laze under an umbrella in the garden, the children easily make easily at the tennis court, the playground, or at the outdoor or indoor swimming pool with jacuzzi. It is surrounded by a large, enclosed lawn with trees here and there, and a swing. The terrace is the ideal place for you to start reading a new book. You can prepare delicious evening snacks at the stone barbecue! The interior of the house is neatly taken care of. In the morning you can walk to the camping a bit further on up the road, to buy fresh bread and hot meals in the evenings. You can do groceries here, rent bikes and make use of the free wifi. You are 500 m away from the ocean. 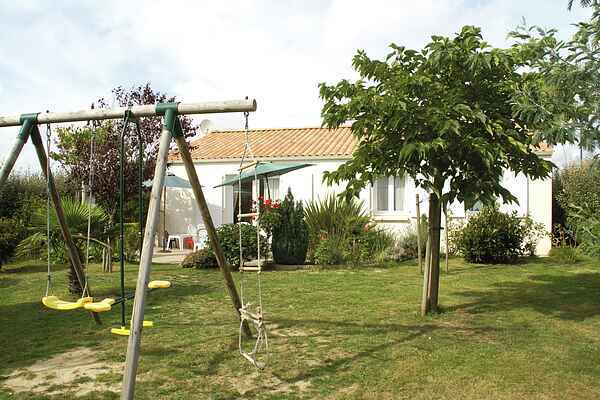 You will spend most days at the beach near Port-Bougenay (3 km). For a change from all that swimming and beach fun, you can visit the ancient abbey of St. Jean-d'Orbestier. You shouldn't miss a visit to the automobile museum and the castle of Talmont (4 km)! In Talmont you will also find a large supermarket and several restaurants.